La Guardia was a lawyer and reform-minded politician. 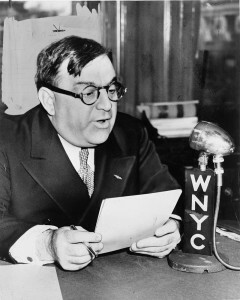 He served in Congress before his election in 1933 as mayor of New York, running on the Fusion ticket, which united the Liberal and Republican parties. His object was to reform the corrupt Tammany Hall Democratic boss system. He did just that, making sweeping reforms that became the envy of the nation. Through three terms as mayor, he emerged as a beloved figure of infinite energy and great compassion, fighting corruption and organized crime, bringing new efficiency to city services, expanding municipal social-welfare services, and introducing slum-clearance and subsidized housing. Many consider him the greatest mayor of any major American city—ever.